I like to think of playing the market like playing a game. And right now, it’s that time of the quarter – it’s primetime earnings season! An earnings announcement is the biggest and most consistent mover of a stock that there is. Every quarter, publicly traded companies are required to announce earnings. And if those results are better or worse than expected, then the stock can skyrocket or plummet overnight. 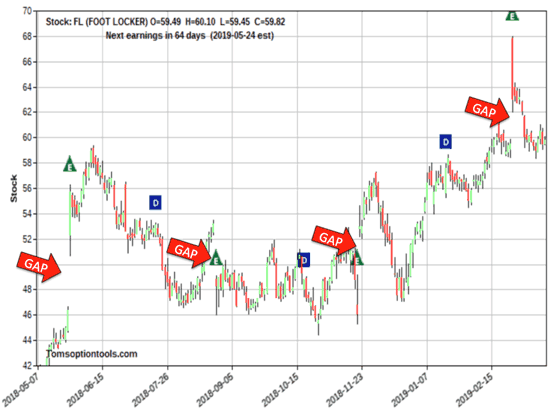 At each of the last four quarter’s earnings announcement (marked by a green “E” triangle), Foot Locker has gapped. If history repeats itself, (which it tends to do), we can expect it to gap again at the next earnings report. 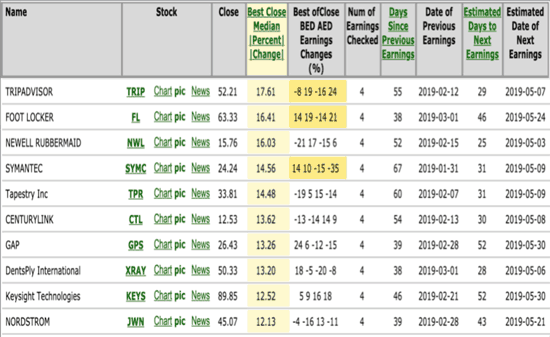 It’s important to note that FL gapped in both directions over the past four earnings announcements – making it difficult to know in which direction it will gap this season. And Foot Locker is not the only stock that does this. There are many. And that volatility isn’t a bad thing. In fact, this is exactly the kind of topic I cover in my Million Dollar Masterclass. If you want to learn how to cash in on any company’s earnings – good or bad – using one simple strategy… you need to see this. Stocks that repeatedly gap at earnings spell one thing: opportunity! Now, there’s only one way to trade this reliable pattern, and it can’t be done by buying the stock. If we did that, then we would need the stock to gap up. But what if it gaps down, like Foot Locker did? 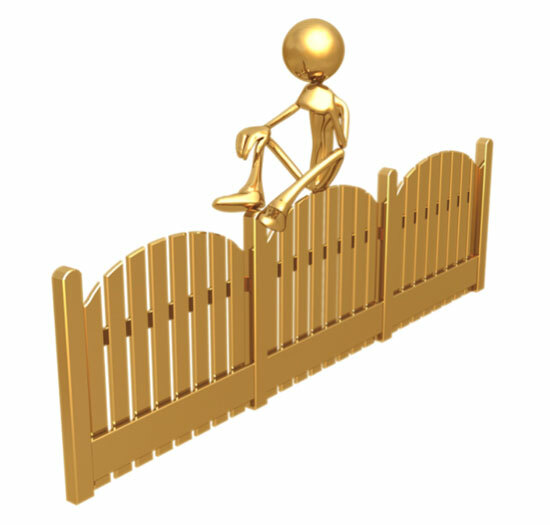 When it comes to volatility surrounding earnings, we need to be able to straddle the directional fence. And we need options to do that. Just one option won’t do, though. Specifically, we need both a call and a put option. If the stock gaps up, then we will make money from the call options. If the stock gaps down, we will make money from the put options. Either way, we’re protected. Now, for straddles to profit, the winning option must make more money than the losing option loses. But remember, both calls and puts have limited risk, so you can only lose what you spend on them. To make money from straddles, we want to play the stocks that historically gap the most. And with one of my scanners, I was able to do just that. Now, I’ve talked about using straddles during earnings season before. But after such a successful Q1 2019, this season’s earnings are going to be one of the most important seasons to date – making this strategy even more profitable. Now, this is just the tip of the iceberg with respect to straddles. You see, options get more expensive as their earnings release date approaches. Typically, options traders will pay a premium for both calls and puts in anticipation of a gap at earnings. This is similar to ticket scalpers selling Super Bowl tickets at a premium up until kickoff – options get more expensive as the event approaches. Demand increases, driving up the price. In this situation, the expense of options is also referred to as “implied volatility,” or IV. The IV chart on Trip Advisor Inc. (NYSE:TRIP) illustrates exactly what I’m talking about. 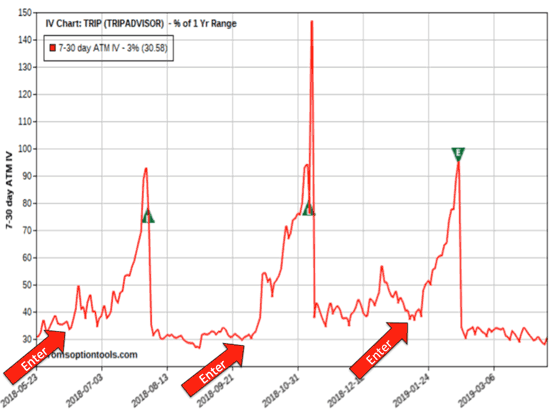 Options on TRIP get more expensive right up into earnings. The red line represents IV, and it creates a reliable, repeatable pattern that looks like a heartbeat. Notice that the IV begins to rise about a month before earnings and then tanks immediately after earnings. This is the risk when it comes to straddles. You don’t want to place them the day before – if the stock doesn’t move enough, you could get crushed. Which is exactly why we purchase straddles four weeks before the earnings announcement. It prevents us from paying too much and limits our risk along the way. 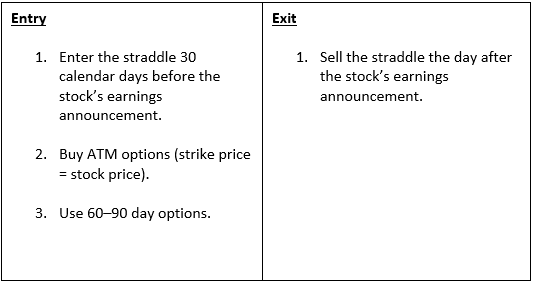 Earnings season is the perfect time to put the straddle strategy to use. By buying both a call and a put option, you are set to profit no matter which direction the stock gaps after earnings results come out. Earnings season kicks off tomorrow morning, April 12, 2019, before the bell. And while the other guys scramble to save their portfolios against all of the gapping stocks, you don’t have to worry – with the power of straddles, you’re ready to take 2019 Q1 earnings season by storm. 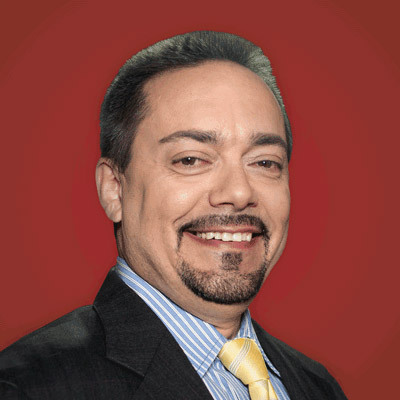 My colleague, Shah Gilani, is hosting a VERY special event on April 18. If that’s you, then please click here to RSVP. If you only like mutual funds, index investing, and conventional blue chips, then please do not join. This event is only for people who want to have a shot to make fast, “10X-Your-Money” gains on a regular basis.